A lavish volume of photos and essays featuring the wild beauty of western British Columbia and Alaska. In this modern world, where it is estimated that three-quarters of the earth's ice-free land mass has been altered by humans, how many people have ever been somewhere they could truly experience pristine wilderness? Few mountain ranges in the world are as wild or beautiful as BC and Alaska's Coast Mountains. From remote fjords to soaring summits, North America's westernmost mountains offer innumerable challenges and sublime delights. And yet they remain relatively unexplored. Partners, co-authors and photographers John Baldwin and Linda Bily have ventured into the magical landscapes of the Coast Mountains. Travelling by foot and ski, their goal was simply to experience and document as much of these remote places as possible, to wander across the high meadows, ski from mountaintops and revel in the artful patterns of new-fallen snow. This stunning coffee-table book is sure to inspire readers to discover and connect with the intense beauty of this mountain wilderness. "We are fortunate to live near the western mountains of British Columbia, which contain some of the last wilderness in North America outside of the Arctic. The mountains are home to grizzly bears and wolves, and where salmon run wild and mountain goats and wolverines roam through terrain that has not changed since the arrival of Europeans to North America. 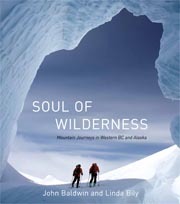 This book is a look at those wilderness areas: their beauty, their essence, their soul." Check out the new video by Jordan Manley that was partly inspired by our book Soul of Wilderness. It features a ski trip across the Homathko Icefield. Crossing Home: A Skier's Journey | Series Finale from Jordan Manley on Vimeo.